During past Olympic Games, it was difficult to find ANY coverage of shooting events, much less real-time video, or comprehensive match scores. In the past, the main broadcast channels might feature one or two events, but only if an American was likely to win a medal. For 2008, that has all changed. NBC has dedicated vast resources to providing in-depth, web-based coverage of ALL Olympic events, including shooting sports. 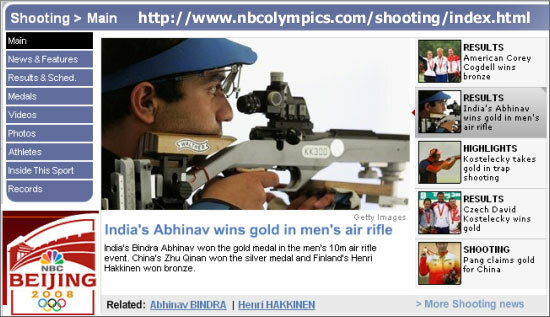 On the NBC Olympics website, you’ll find the latest shooting event results, complete with scores, photos, and videos. There is even a special Inside This Sport section that provides technical information, with specifics on the firearms used, and the courses of fire. The NBC Olympics website is a treasure-trove of information, updated many times daily. Share the post "NBC Website Offers Great Olympics Shooting Coverage"
The downside is that NBC does not allow anyone outside US to view the videos… what a shame.